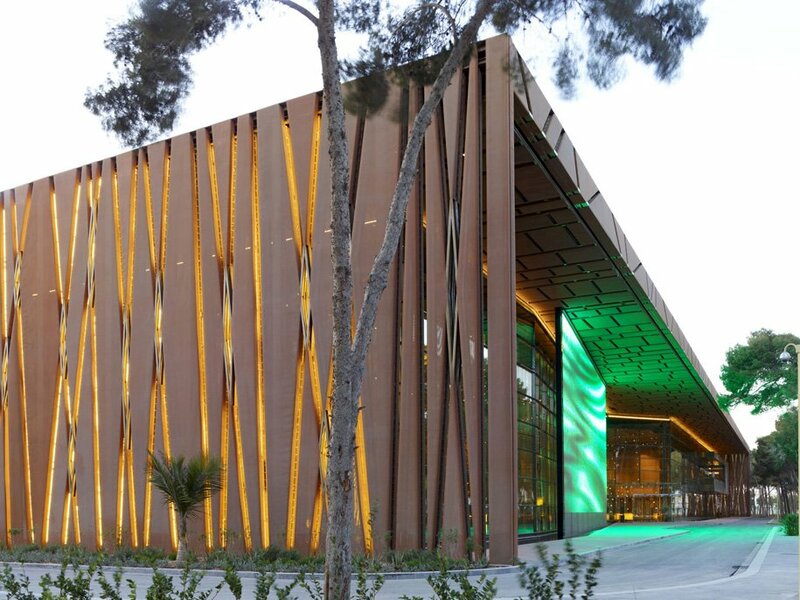 The Tripoli Congress Center by Tabanlioglu Architects is located between the area’s Zoo and vast wilderness. In an attempt to utilize the land, while also preserving the surrounding trees, the architects built the center in a portion of woods where no trees existed at the time. Completely engulfed in wilderness, the two-story building’s exterior mimics it’s surroundings, utilizing a mixture of semi-transparent GKD Kiwi mesh with glass walls enveloping the interior. The pattern, created from the combination of the metal mesh material and the glass openings, was inspired by tree branches and allows the building to become a harmonious addition to its wooden surroundings.